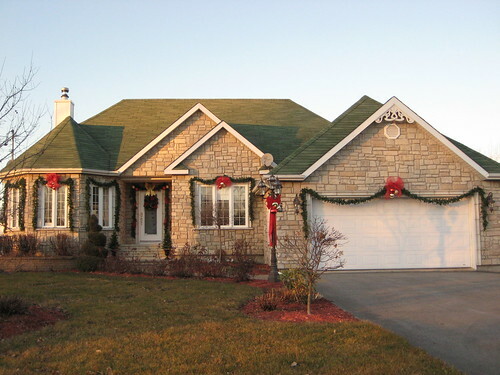 Moonbeams in Cyberspace: DECKED OUT FOR CHRISTMAS! We have had the most awesome November that I can remember! The sun has been shining bright and the temperatures have been unbelievable. 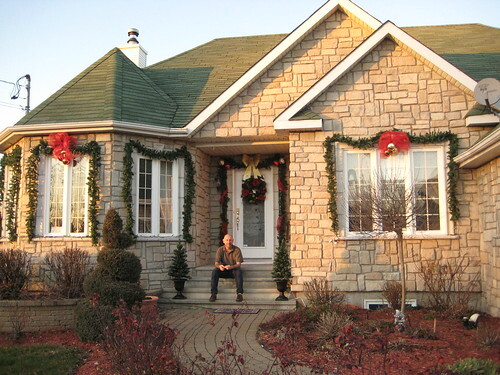 Which has made putting the xmas decorations up on the new house a real pleasure. Seriously, it has been t-shirt weather as long as the sun is out. Chris has done the best part of the work ofcourse..as I deligate and decide details lol. We are pretty happy with the results. What do u think? Click any photo to make bigger or if u want to see the few more pics that are in flickr...I am now ready for it to snow! Lots of it! Everything will look marvelous with all the white..I am hoping to take a nice photo at xmas time, with the lights of the xmas tree peaking through the front window, lots of snow outside...to use as my xmas card next year..but I am no photographer lol...we will see. Posted by Moon at 7:20 p.m. It looks great, Chris did an excellent job. I can't wait to see it with snow. 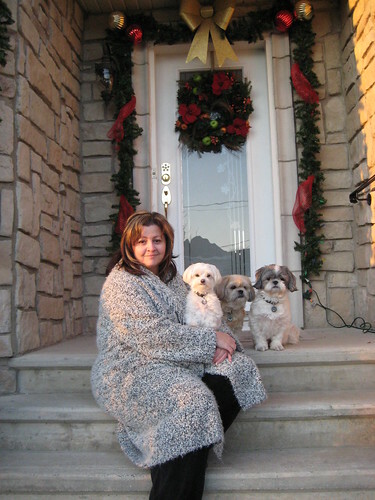 I love the three dogs on the front porch, that would make a cute card too. It looks really nice, Moon. Chris did a good job (with your directions). I do think you have the cutest dogs in North America! Moon and Chris...You new home looks beautiful in it's Christmas finery. Your pups look adorable, posing with you and alone. 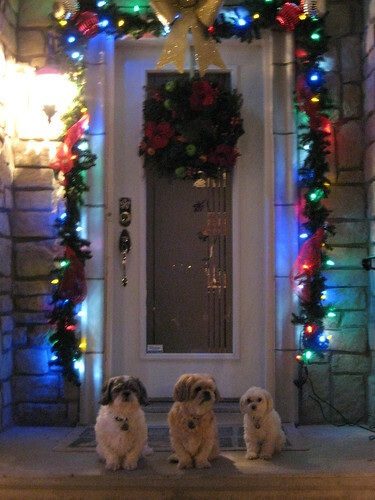 Very festive but the doggies steal the show. Got our first snow fall today! Couldn't Help Myself, these are too cute!